The terms impingement, rotator cuff tendonitis, and subacromial bursitis, all refer to a spectrum of the same condition. The shoulder is one of the most complex joints in the human body. It is complex because it allows a range of motion greater than any other joint. The shoulder is made up of the shoulder socket (called the glenoid, which is part of the scapular or shoulder blade) and the humerus which is the upper bone of the arm. The collarbone or clavicle also contributes to the shoulder joint. Movement of the shoulder occurs at two sites. Firstly, the shoulder ball “humeral head” moves within the socket (glenoid). Secondly, the entire shoulder blade or scapular moves over the chest wall or ribcage. There are numerous ball and socket joints within the human body. The shoulder joint is remarkable because relatively speaking it has the largest ball in the smallest socket. This is necessary to allow its wide range of motion. It is analogous to a golf ball sitting on a tee. The disadvantage of this arrangement is that it increases the risk of dislocation. That is to say that it is not hard to knock the golf ball off the tee. The hip joint is an example of a ball and socket joint where there is a very large socket which strongly resists any dislocation of the ball out of the socket. Like most joints in the human body, a smooth surface coating not unlike Teflon, covers the ball and the socket. This is called the articular cartilage. It allows for easy movement of the two surfaces over one another with minimal friction. It is lubricated by joint fluid. 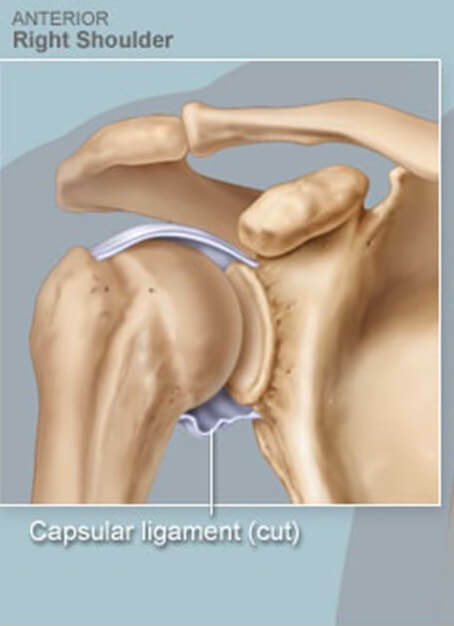 Because the shoulder socket is relatively small it has a rim of strong cartilage tissue around it called the labrum. The labrum affectively increases the size of the socket, adds stability and improves cushioning. 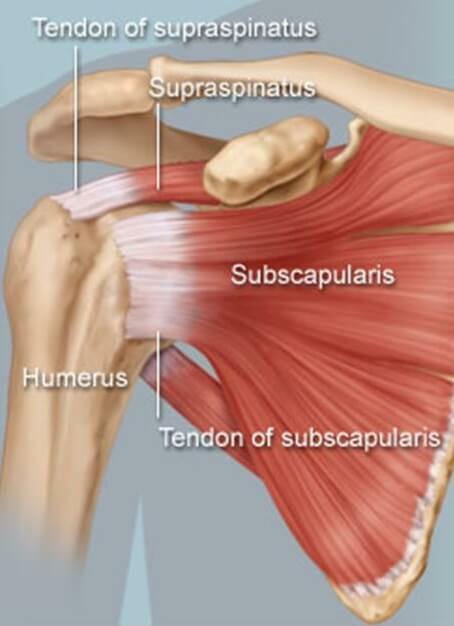 The subacromial bursa is a lubricating sac which sits between the rotator cuff tendons and the bone above them. This bone is called the acromion and is part of the shoulder blade or scapular. The bursa helps tendons glide smoothly when they come in contact with bone or at prominent areas on your body. For example we have a bursa at the elbow and also at the knee and the back of your heel. Impingement: Impingement refers to contact between the tendons of the rotator cuff and the undersurface of the acromion bone when you raise your arm. The bone impinges upon the tendon and the intervening subacromial bursa. This causes irritation of the tendon and pain. Rotator cuff tendonitis: This refers to inflammation or damage of the rotator cuff tendons. Subacromial bursitis: The bursa becomes inflamed and swollen with fluid accumulation as a result of impingement. It is important to recognize that the tendonitis and bursitis occur secondary to the impingement process. 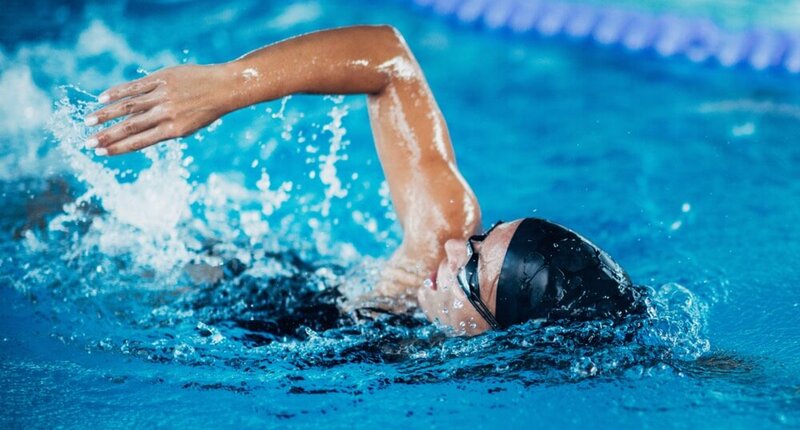 Impingement occurs in a younger athletic population when they are involved in sports with repetitive overhead motion such as swimming and tennis. Throwing sports such as baseball are also a common cause. Some occupations involve similar repetitive overhead activities which can precipitate impingement. Impingement can occur in any age group as a result of a relatively minor injury. Injuries that results in swelling of the rotator cuff tendons causes the tendons to rub against the bone of the acromion. This causes more inflammation and sets up a vicious cycle of rubbing causing swelling and swelling causing more tendon rubbing.Impingement occurs in an older age group as a result of subacromial spur formation. The bone spur reduces the available space for tendon movement and rubs against the tendon. Pain exacerbated by lifting and reaching movements. Pain in the athlete precipitated by overhead sporting activities. Pain radiating from the front of the shoulder down the side of the arm. Pain initially with activity but later occurring also at rest and then finally at night. Loss of strength of the shoulder, particularly lifting the arms to the side. Difficulty doing activities behind the back such as a zip or reaching backwards for a seatbelt. One of the hallmarks of impingement is a painful arc of abduction. Abduction is the medical term for the motion of lifting the arm to the side. The pain starts as you lift the arm and continues to a point but then disappears as the arm reaches a full overhead position. The reason for this is that the inflamed tendon passes completely under the acromion bone at the top of this movement and is not impinging at that point. The initial investigation is with an x-ray looking for a bone spur or for other causes of pain such as arthritis at the AC joint and the end of the clavicle. An MRI scan or ultrasound is then usually performed. The scan should be able to rule out significant rotator cuff tearing. The scan will show inflammation of the bursa. Remember that inflammation of the bursa is not the primary problem, rather it is a reaction to the underlying problem. Initial treatment is almost always going to be non-surgical. Firstly avoid the precipitating activities. Panadol and anti-inflammatories are appropriate for the pain. Once the symptoms are settling a physiotherapist can instruct on a set of shoulder stretch and strengthen exercises. It is important to stretch out the posterior capsule at the back of the shoulder joint. This can be done by stretching the arm across the front of the body. If symptoms are not settling then cortisone injections into the bursa are one of the most effective treatments for this condition. The injections may be repeated on a monthly basis for a course of up to three injections. Cortisone is a powerful anti-inflammatory. The injections are usually done under ultrasound control to ensure that they are in the correct place. Surgery would generally only be considered if symptoms were continuing on beyond three to six months after exhausting all of the non-operative treatment options. The only exception to this might be if there was a particularly prominent bone spur. The presence of a substantial spur would suggest early surgery might be appropriate. Surgery is aimed at creating more space for the tendons to prevent them from impinging against the bone. Surgery also removes inflamed bursal tissue. The process of creating more space involves shaving bone from underneath the acromion. At the same time any prominent spur is removed. This process is referred to as subacromial decompression or acromioplasty. These two terms mean the same thing.This procedure is performed arthroscopically. It requires two small keyhole incisions, one at the back and one at the side of the shoulder. A burr is used to remove excess bone and a shaver is used to remove inflamed bursitis. Following this type of surgery, a sling is used for the first twenty-four hours but thereafter for as little as possible. The aim of rehabilitation is to restore range of motion as soon as possible after surgery. The physiotherapist will see you the morning after surgery and instruct on a set of stretching exercises. There is no risk of you causing any damage to the shoulder by moving it actively and as much as your pain limits permit. Because the procedure involves shaving of bone, it takes at least three months for that bone to grow a new smooth surface and for the soft tissue inflammation to settle. Most patients three months after surgery feel that their condition has improved although symptoms may not resolve completely for much longer. Keyhole shoulder surgery is extremely low risk and generally has an excellent prognosis with good long term results. As with all surgical procedures there is a risk of infection but keyhole shoulder surgery carries a very low infection risk. Post-operative frozen shoulder does occur but generally can be avoided with appropriate rehabilitation. Bleeding or clotting problems are uncommon following this type of surgery. Damage to nerves and arteries is also exceedingly rare. It is hoped that by removing spurs we can prevent this impingement process from proceeding onto rotator cuff tearing in the future. However that is not guaranteed. The rotator cuff can still tear due to underlying tendon degeneration even if a spur has been removed. Following successful acromioplasty and subacromial decompression, most patients return to normal activities in the long term. This condition is not a precursor to arthritis in the shoulder.